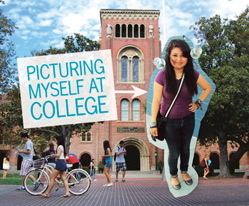 Visiting schools made 16-year-old Yesenia's dream seem more real. When I was in middle school all I knew about college came from UCLA and USC posters I saw hanging on the wall. I thought college was where you automatically go right after high school, where you get something called a “degree,” and then got a job. I had no idea how expensive it would be and how many different universities there were. All I knew was that I had to go. The cool kids didn’t accept Charmaine, 18, but she finally found a group that did. Going to a treatment center for troubled kids helped Tiffany stop fighting and become someone she's proud of. Getting around on his bike gives 17-year-old Sam the freedom to explore the city. Anthony, 16, loves to dance but he had to overcome his fear of performing. It might not be cool, but 17-year-old Jose loves learning and the friends he's made. When a girl smoked marijuana she was more irresponsible and she started losing her friends. Learning CPR makes Sydney, 14, feel more prepared in an emergency. Patricia, 19, has spent months trying to find her first job. Kheri, 16, says it's fun to be a cheerleader because she gets to pump up the crowd at football games. A proposed freeway extension could demolish the houses in 17-year-old Audrey's neighborhood. Between Jerry Brown and Meg Whitman, Aaron, 15, wanted to find out who would be best.